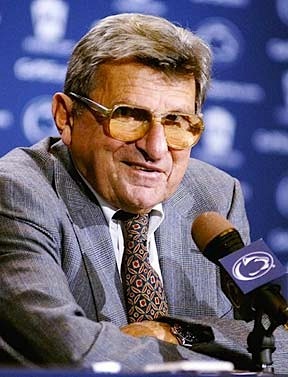 UNIVERSITY PARK – Michelle and Kevin Coppola, Penn State graduates who live in Elkridge, Md., are the proud owners of a pair of Joe Paterno’s iconic eyeglasses. The Coppolas bid $9,000 for the thick-lensed glasses during Penn State Public Broadcasting’s 18th annual Connoisseur’s Dinner and Auction Saturday at the Nittany Lion Inn. Given that those lenses were the basis for the Hubble telescope, I actually think $9,000 is kind of a bargain. Next PostNext a man of means by no means.